Italy Bonini Garage Carlo Bonini’s Bonini Garage will be displaying two restored Ferraris at Homo Faber. Based in Cadelbosco di Sopra, a small town near Reggio Emilia, Carlo Bonini has been expertly restoring cars for more than 30 years. 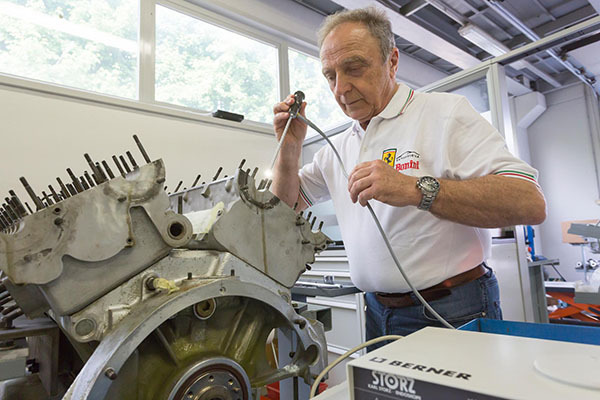 The Bonini garage has been providing mechanical assistance specifically dedicated to Ferraris for nearly 30 years. It has been officially authorised as a Ferrari service and works with the latest electronic equipment for diagnosis and tuning. All this without forgetting the classic old Ferraris on which the company actively performs all kinds of restoration and repairs. Italy Konner S.R.L Konner S.R.L will be showcasing the assembly of the company's K1 two-seater helicopter during Homo Faber. Visitors will gain first-hand insight into the world of cutting-edge aeronautical products. Sergio Bortoluz founded Konner S.R.L in 2002. 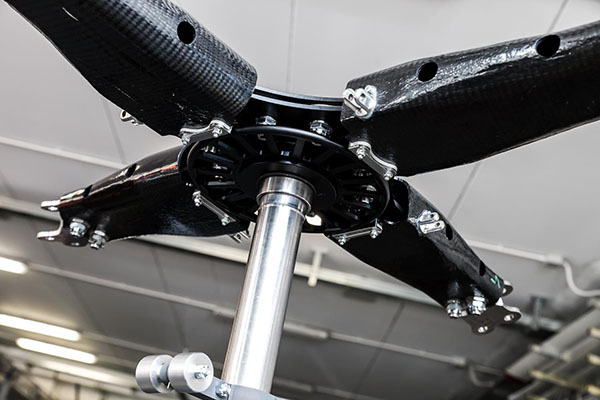 He has used his 25 years of experience in the field of turbine construction and precision engineering to develop two key products: the TK250 turbine and the K1 two-seater helicopter. Konner’s products use ground-breaking technology that allows them to reach an optimal power/weight ratio, and they are unique in their use of highly available fuels such as diesel. Spain El Solitario David Borras (alias El Solitario), superstar of customised motorbikes, will be displaying two motorbikes at Homo Faber. His company prefers to build and ride vintage-engineered bikes made from iron rather than more modern solutions, but it also likes the thrill of a challenge. Borras believes in giving bikes character by using traditional craftsmanship and taking obsessive care over the small details. From his garage in the heart of Galicia in northern Spain, David Borras alias El Solitario creates custom-made motorbikes, embracing all the separate elements in a motorbike, separating them and highlighting them instead of hiding them. He creates a distinct style which is instantly recognisable. The bikes combine the pinnacle of motorcycle technology with features of classic design. Each motorbike is the product of the company's experience and, much like the unique nature of experiences, so each motorbike is unique too. United Kingdom Hartley Cycles Metalworker Caren Hartley will be working on creating and assembling custom-made city bikes at Homo Faber. Caren will be present for six days during the exhibition. She is passionate about making bikes for both men and women that are equal in beauty and performance and, most importantly, perfectly fitted to the rider. Hartley Cycles is the culmination of over 10 years of fine metalwork and a love of cycling. 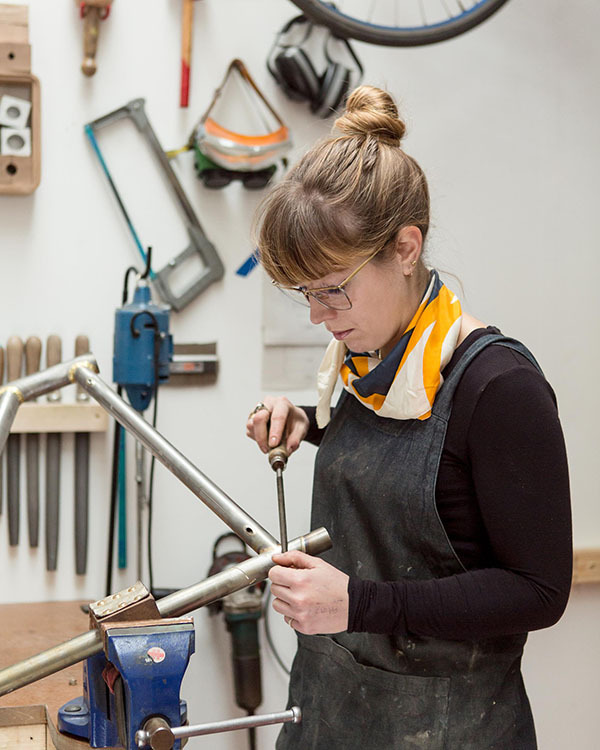 From a small workshop in South London, award-winning frame builder Caren Hartley creates beautiful steel and stainless steel bicycles uniquely tailored to each client. Her bikes are made by combining a variety of metalwork techniques such as bronze brazing and silver soldering. Some are specific to bicycle manufacture and she developed others during her multidisciplinary metalwork career. Italy Pedemonte bike Pedemonte Bikes will be present during one week in Stefano Micelli’s Workshop Exclusives space at Homo Faber. 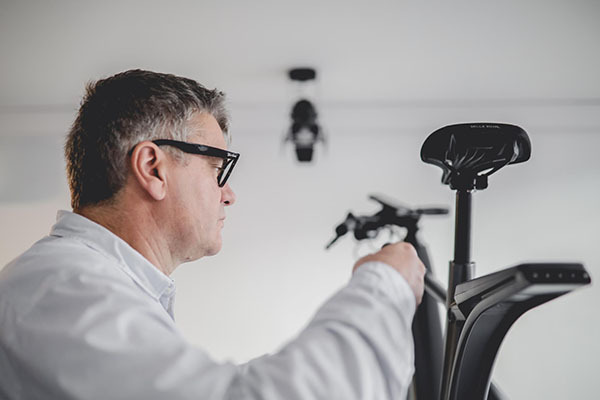 Pedemonte Bikes uses their technical knowledge gained over 30 years of manufacturing carbon fibre frames for cars to produce bike frames that match their customers' every requirement while ensuring optimal quality and comfort. Pedemonte started to manufacture carbon fibre car frames in late 1970 for some of the biggest names in the automotive industry. Pedemonte has now built on this unique expertise and transferred this technology to the creation of custom-made bikes. Like a racing car, each Pedemonte bike frame is engineered and built to fit the exact requirements of the customer, aiming to provide optimal comfort. 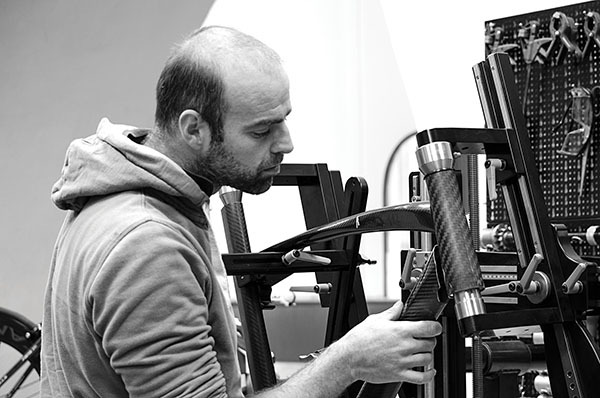 Thanks to customer participation throughout the production phase, Pedemonte ensures that each bike frame is tailor made and unique. Italy Bottega Conticelli Artisans from Bottega Conticelli will be present throughout Homo Faber working on customising two Vespas. 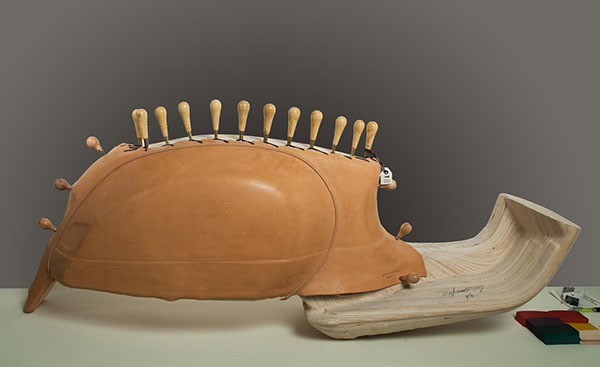 The artisans will display their methods of customising a Vespa with leather details, equipping the vehicle with pockets, detachable bags and numerous custom-made accessories. Stefano Conticelli founded Bottega Conticelli in the heart of Umbria, Italy. The company specialises in luxury accessories, developing their objects and furnishings entirely in-house. Attention to detail and the high quality of the finished works have helped establish the company's place in the market. Fully designed and engineered according to the brand’s unique vision of ultimate quality, their work stems from time-honoured local craftsmanship, pioneering research and development as well as careful manufacturing, all based on unique designs by Stefano Conticelli. Monaco Stajvelo For one week at Homo Faber, Stajvelo will be assembling their RV01 eco-bike in the Workshop Exclusives space curated by Stefano Micelli. Thanks to a careful selection of materials, their handmade bikes are environmentally-friendly, grease-free, chainless and recyclable. 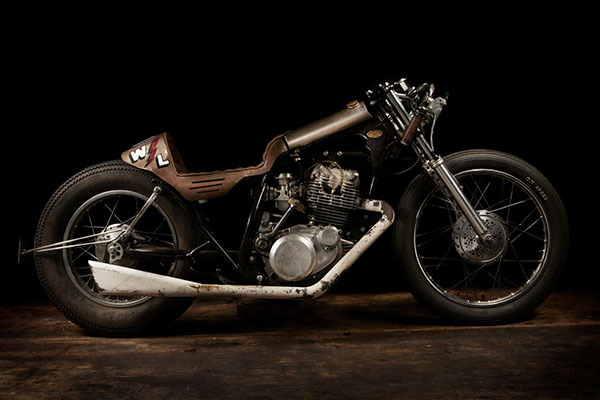 Simplicity is never easy but Stajvelo’s bikes go straight to the essentials. Stajvelo's philosophy is rooted in simplicity, ecology, comfort, design, and above all, riding pleasure. Thierry Manni created the company in 2017. The expert knowledge of ten or so people was brought together to produce their first eco-bike, RV01. The advanced components of the bike frame make it unique. Its automatic transitions, simple maintenance and easy on and off parts make it simple to use. The bike's well-studied geometry, shock-absorbing handlebar and latest model seat ensure it is comfortable to ride.